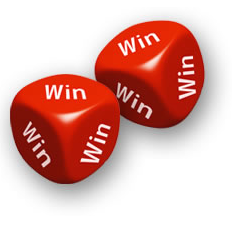 One of the discoveries of my interest in a small wins approach is the concept of win – win. I noticed in my many examples in this site of successful innovation often involves a win for the customer (e.g. easier, simpler experience) and a win for the brand or business (e.g. increases sales or customer retention). Perhaps the same win – win framework also applies to employee engagement? Many of these types of engagement programs I have seen are skewed one way or the other. There are bright and bubble employee programs but seem to lack a business benefit. And those which try and drive employee engagement but seem to be designed by a financial accountant — all numbers and targets but without emotion or passion. So what might a win-win employee engagement program look like? 1. Think of engagement as less like a program and more of a culture. It becomes just the way we do things around here. A program implies a start and a finish but employee engagement surely is an ongoing goal. I do not think there is any one score that measures engagement. Leaders should use measures such as enjoyment, fun (soft measures) and tenure for example (e.g. hard measure). 3. Engagement is about a big goal or vision and a series of small steps to get there. One of the major roles of any leader is to outline the broad direction or a big goal for the team to achieve. This can be highly motivating for all the team members. But this needs to be mixed with a small steps strategy to outline how to get there. And with the accomplishment of every small step along the way there is a small win. According to Harvard Professor, Teresa Amabile this is one of the best ways to engage staff. One of the most effective ways to boost improvement in performance is through constant feedback. The feedback can be small (e.g well-done answering that question today), timely and specific. Constant, honest, constructive feedback can also lead to greater engagement. 5. A win – win engagement program should benefit the group and the individual. Because every individual has their own needs and expectations at work these need to be reflected in any engagement program. On the other-hand the program also needs to benefit the many. This will require greater creativity and innovation in the design of such programs. And perhaps piloted using a small wins approach.